Southgate Centre has been a familiar and frequented mall for me since I was young. I remember hanging out as a highschooler in 2 iterations of the food court prior to its current state. Since becoming a mother, I’ve noticed and been impressed with a lot of the changes the new renovations have brought, like a mother’s room in the main bathroom, free concierge service, free rental of riding cars for kids. I have also noticed some really cool green changes that I think are worth mentioning – in the hopes that Southgate could be seen as a model for other malls to follow. The installation of 38 new three compartment waste containers in the existing and expansion mall common areas have had a very positive result in our recyclable bottle and can capture rates, as well as an improvement in the paper category. The food court’s organic waste collection program has thus far diverted 23 metric tons of organic material to the City of Edmonton composting facility and the ‘condiment capture’ program has sent 450 pounds of unused condiments to our local Food Bank. 1. How did Southgate’s environmental initiatives start? We have always recycled cooking grease. In 1994, we initiated a recycling program to reduce the amount of product going into landfills. The “greening of Southgate” really took off with the purchase of Green Power around the mid 2000s and has grown exponentially since then. 2. Who does Southgate work with in its recycling programs? We work with Waste Management (cardboard, co-mingling and organic waste, wooden pallets), Northern Alberta Processing (cooking oil), Aevitas, a hazardous waste recycler, the Beverly Bottle Depot (refundable containers) and Habitat for Humanity (hoarding waste). 3. How does the Blue Bag program work with mall tenants? Do the majority of tenants participate in the recycling program? With the Blue Bag Program, we distribute a reusable “Southgate Recycles” branded bag that includes 20 blue bags to all tenants. Once tenants use up the initial 20 blue bags, they can come to Guest Services to get 20 more bags. They can do this as frequently as needed. Yes – the majority of our tenants participate in our Blue Bag Program. 4. What has been the public’s response to Southgate’s environmental programs? The public response has been overwhelmingly positive to our environmental programs. Like us, most if not all of our shoppers care about the environment, and we have received feedback that the steps we have taken are appreciated. 5. Has Southgate been in contact with other malls and centres to discuss implementing these programs elsewhere? All of the malls in the Ivanhoe Cambridge portfolio have now been set targets for waste diversion that they must strive to achieve. According to our internal calculations, Southgate’s unofficial diversion rate for 2013 is 50.4%. There you have it! 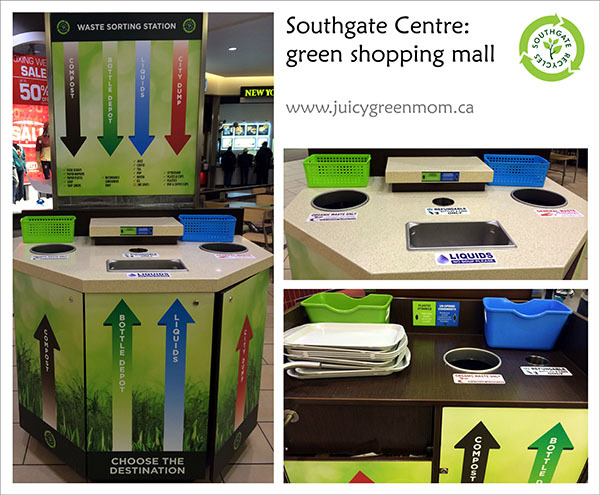 I am really impressed and proud to see a local mall with such great waste diversion and recycling initiatives. Let’s make sure we take advantage of them! Do you know of any other green shopping malls? I was too! Now I just hope that other malls (or rather their management companies) will follow suit!